The Men who Stole the World: An interview with Nicholas Shaxson NICHOLAS SHAXSON Essentially, then, tax havens are about wealthy individuals and corporations taking their money elsewhere to do things that they wouldn’t be allowed to do at home....People have always thought of tax havens as sideshows to the main event, whereas in fact they are central to the global economy....Essentially, then, tax havens are about wealthy individuals and corporations taking their money elsewhere to do things that they wouldn’t be allowed to do at home.....in 2008 $1.2 trillion – that’s trillion, not billion – leaked as illicit flows out of developing countries. If you compare that to the $100+ billion of foreign aid going to developing countries, you’re looking at one dollar going in as aid and ten dollars going out under the table. So there is a huge problem there. There has been a massive focus on foreign aid, which in general terms is not a bad thing, but one of the problems has been, and this is very much true under New Labour, the ignoring of the bigger issue of huge illicit outflows, which are associated with tax havens, crime, and so on. The drug trade makes heavy use of the offshore system. ... we are now talking about tens and hundreds of millions of dollars. In terms of the overall scale of what is happening offshore there are various different estimates. One is by Raymond Baker who wrote a book called Capitalism’s Achilles Heel and who now works for Global Financial Integrity in Washington. According to his analysis criminal money – which includes money from the drug trade, as well as various other sources – accounts for roughly a third of the overall picture. Corruption money, the focus of so much attention, amounts to only three percent of the picture. The remaining two-thirds is commercial money – transfer mispricing, tax avoidance and evasion by corporations, and so on. All of these different components use the same facilities and the same corporate and secrecy structures. They are all in it together. So there is a very unhealthy proximity of the criminal and the commercial being incubated offshore. [2016 Feb] Six out of Britain's 10 biggest firms pay ZERO corporation tax despite ringing up global profits of £30billion Shell paid no corporation tax in 2014 despite global profits of almost £20 billion....Lloyds Banking Group said it paid no corporation tax in 2014 after offsetting losses in previous years against a profit of £1.76billion. Vodafone said it paid no corporation tax in 2014/15, despite making profits of £1.97bn in the year to the end of March 2015. 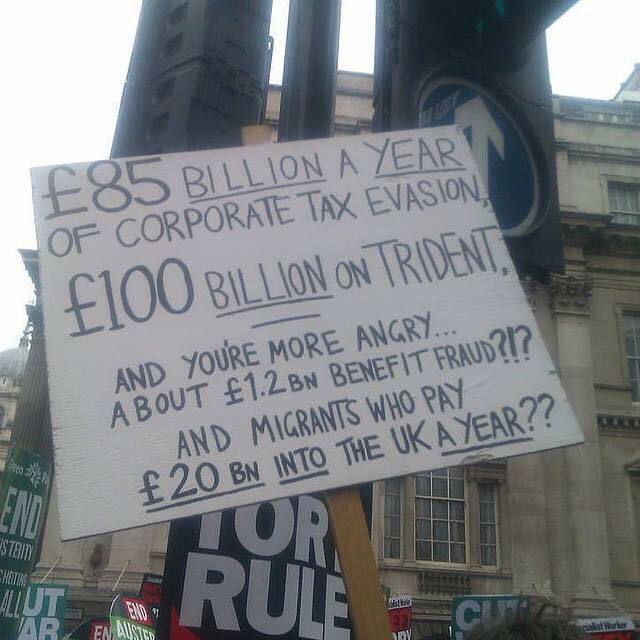 Also on the zero corporation tax list was British American Tobacco (BAT) - the firm paid corporation taxes in other countries after profiting by £4.55billion in 2014 but none of it was paid in Britain. ....Pharmaceutical firm AstraZeneca said it paid no corporation tax in 2014, telling the Sunday Times it made no taxable profits. Big Oil, Big Profits, Big Tax Breaks Stripping the tax code of these special Big Oil tax breaks for these five companies that earned $72 billion so far in 2013 would provide $24 billion of revenue. This is revenue that might otherwise be cut from cancer research, Head Start, food stamps or other vital middle- and lower-income programs. Eliminating special tax breaks for the big five oil companies would protect vital investments for our health, safety and prosperity. The drug trade makes heavy use of the offshore system. ... we are now talking about tens and hundreds of millions of dollars. In terms of the overall scale of what is happening offshore there are various different estimates. One is by Raymond Baker who wrote a book called Capitalism’s Achilles Heel and who now works for Global Financial Integrity in Washington. According to his analysis criminal money – which includes money from the drug trade, as well as various other sources – accounts for roughly a third of the overall picture. Corruption money, the focus of so much attention, amounts to only three percent of the picture. The remaining two-thirds is commercial money – transfer mispricing, tax avoidance and evasion by corporations, and so on. All of these different components use the same facilities and the same corporate and secrecy structures. They are all in it together. So there is a very unhealthy proximity of the criminal and the commercial being incubated offshore. ..The issue of tax avoidance is incredibly complex on a technical level, but at the heart of it it’s a very simple matter: these are corporations who are using legal or illegal means to cut their tax bills, with the outcome that ordinary people have to pay their tax bills for them. That is profoundly unfair.